What took me so long? I saw this book first during the summer of 2013. One of my Art Quilt Campus participants brought along to share. I nearly drooled on the cover (just kidding) but vowed then that I would pick it up… soon. Soon came nearly two years later during the Edmonton and District Quilt Guild Festival of Quilts in early June. There is was, the cover was haunting me… the holes (yes the white circles are actually holes) kept pulling me back to the rack I first detected the book. It literally jumped off the shelf into my hands and then sort of stuck to them until I carried it to the till to pay. I decided to review the book today as it goes well with the Contest Theme I introduced last week. The theme is “Exploring Line: Make your Mark.” I encourage all of you to explore with pen, machine and/or hand needles and thread, any tool you might find on the table, the ground, the forest floor, the beach that may make a mark on any surface. Not feeling too creative? This book is sure to thwart any creative block or help you climb that giant wall back to creativity! 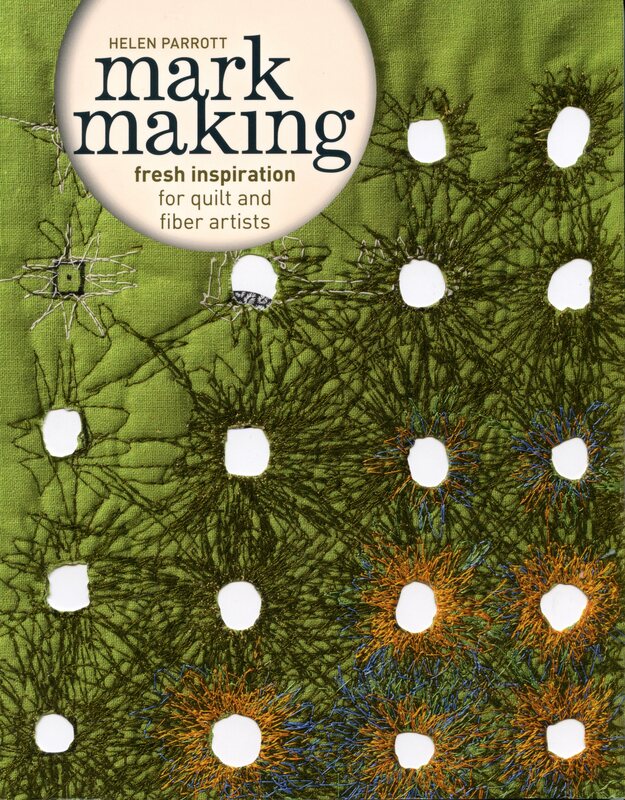 The focus of the book is on making marks on fibers and fabrics. All of the these samples can be translated using pen, pencil, drawing pad, or even a drift wood stick to create lines in the sand on a beach. Let’s go one step further: Did you plant a garden this year? Do you have some lines that have emerged… fresh vegetables, carrot tops, flowers? I saw ad HEARD the proverbial penny drop!! Enough about the summer contest, back to the book on hand. Eight in-depth chapters lead the reader from introduction to the variety of marks one can explore. A clearly written chapter covering the observation, recording and collecting of marks for future inspiration is easy to follow with photographs and sketches. The book’s contents naturally flow from making marks on paper, creating stitches on fabric to translating these explorations into concrete examples and how to make mark making a vital part of the creative life. The book is rounded out with a detailed chapter providing resources for materials, equipment, suppliers and organizations to investigate and join. All around, I love this book and find myself reaching for it often. I know this book is not new. Do you own it? Do you love it? Do you have additional feedback? This is your chance to share in the comment section! 11 Aug	This entry was published on August 11, 2015 at 5:40 am. It’s filed under Art, Book Review, Creativity Update, Design, In the News, Journaling, Motivational, Networking, Sharing Resources, staying in touch and tagged Art Quilt Campus, contest, contest reminder for everyone, creating marks on all surfaces, creativity boost, Edmonton and District Quilt Guild Festival of Quilts, Exploring Line - Make Your Mark, Helen Parrott, inspiration for quilt and fiber artists, mark making. Bookmark the permalink. Follow any comments here with the RSS feed for this post. My book arrived today. I have scanned it quickly. Lots of exciting things to learn. Can’t wait to get started. Thank you Anna. Because of you and Penny Berens, I am seldom without needle in hand. So happy you are inspired, Katina! Enjoy exploring making marks with needle and thread. I may just jump into the fray too and order my own. As busy as I am in my new life I find myself thinking about lines ever since you announced the summer challenge. I thought I had put it aside for now after my spring studies, but a mere suggestion ( your samples that made me drool), has my wheels turning. I’ll be taking a photo of something I’ve created but I don’t think it’ll be fabric and thread. So much fun! As always, thanks Anna! So good to hear from you, Helene!!! Looking forward to seeing ANYTHING you create and share! Leona had the book in 2013!!! Seems like a lifetime ago, Alison! Sadly the library do not have this book. It looks like something I could learn from so Chapters it is. Should be here next week. I would love to participate in the summer challenge, but doubt if I have anything suitable. Yes, I own this book and I have enjoyed it very much . I took a couple of books with me at Christmas time (Regina) and went right through it reading , writing (yes, right in the book) ,and literally just soaking it up . Lots of things called my name and/ or inspired me . The images are lovely and the “Exploration (Exercises) are plentiful and excellent . I find that stitch plus the natural subjects is a relaxing peaceful endeavor. Many things here reminded me of a workshop I took a few years ago right here in Thunder Bay from Dorothy Caldwell . We spent the weekend with her at the TBArt Gallery and she taught mark making , Kantha Embroidery etc. I got a huge taste for mark making there as did several other women . A show of her work was also up at the gallery at that time and it was mesmerizing to see her personal mark making in the quilts. Although I do mainly machine work , I have always had a love for hand stitch as well …probably a legacy from my mother and my grandmothers . Women like Helen Parrott, Dorothy Caldwell and Judy Martin do us such a favour by connecting our hearts and our surroundings to hand and stitch (machine as well) inspiring us to open our eyes wide and see what is waiting to be brought to life in our work . Thank you for your insights, Joyce!